The best thing about the island of Cebu is that it has everything. It has a bustling metropolis, remarkable cultural and historical sites, rich natural resources, and untouched natural wonders, and all these are definitely within easy reach. 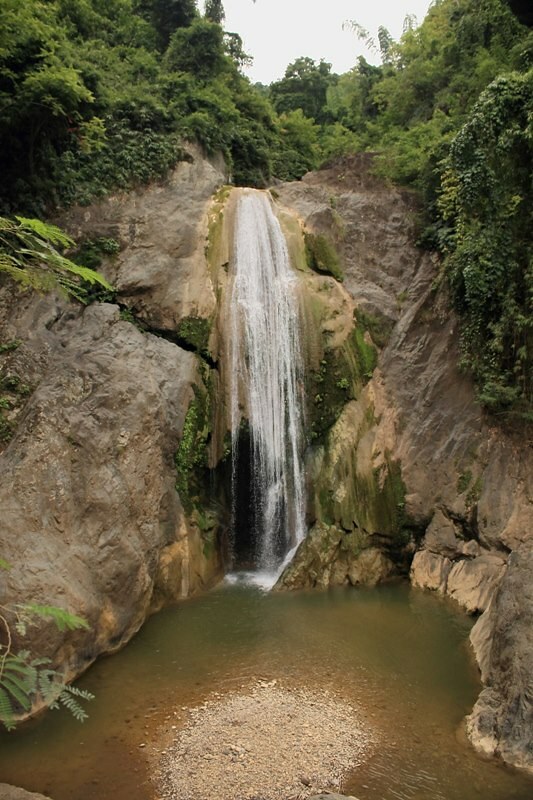 Two of these natural wonders are the beautiful, awesome waterfalls of Kabang Falls and the lofty, imposing Mt. Kan-Irag. Individually, they can be reached in an hour from the city. 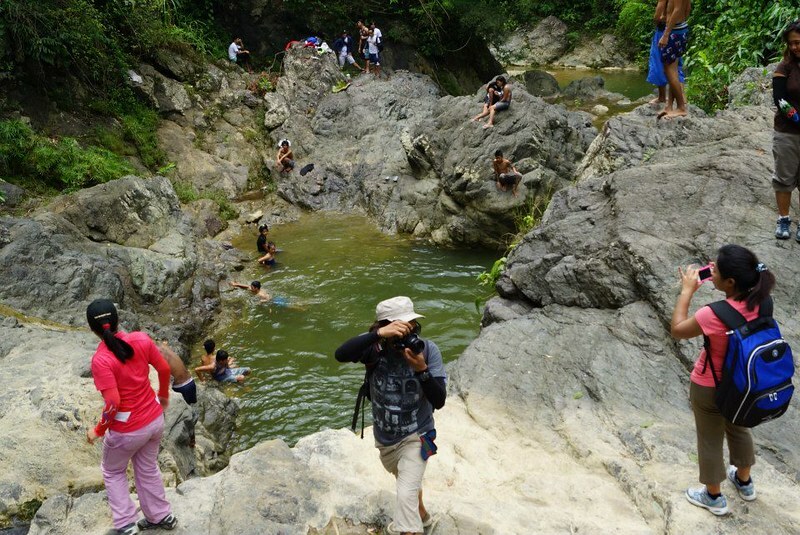 Technically speaking, these wonders are actually within Cebu City! These two wonders are in close proximity so much so that hikers can reach Mt. Kan-Irag from Kabang Falls in just a few hours. 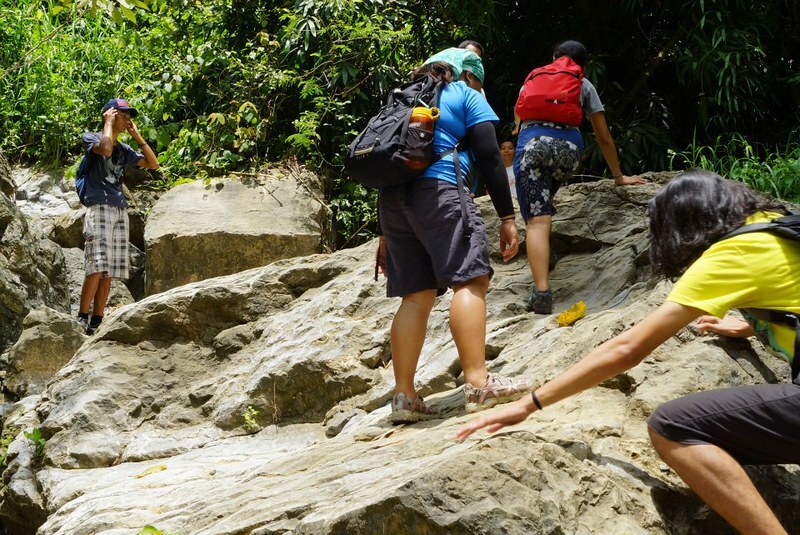 No wonder that the adventure collection of trekking along Kabang River, climbing Kabang Falls, hiking through the meadows of Busay, and camping at the top of Mt. 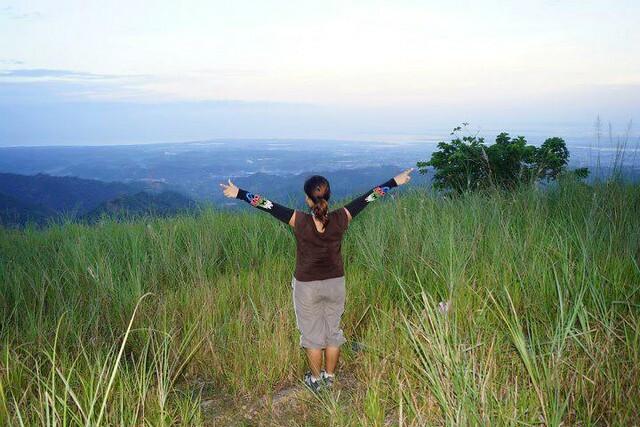 Kan-Irag’s Pedro Calungsod Peak is a favorite among Cebuano mountaineers. 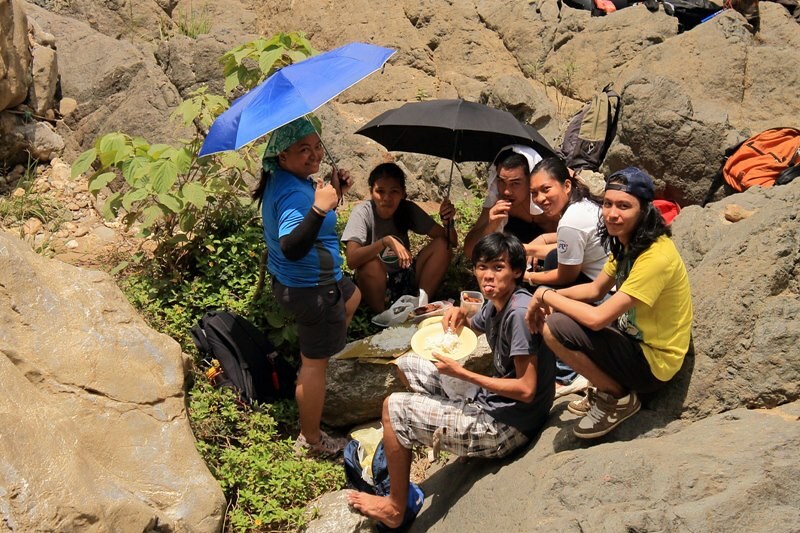 So, last September 16, 2012, Sweetie and I decided to treat her colleagues and friends to a climb to Mt. Kan-Irag starting at Kabang Falls. I was a bit apprehensive at first because no matter how many times I’ve done the traverse, I haven’t memorized the trail (actually, there are many trails to the mountain, but I have a poor sense of direction). However, seeing genuine excitement, I decided to risk getting lost while taking EWIT’s trail. 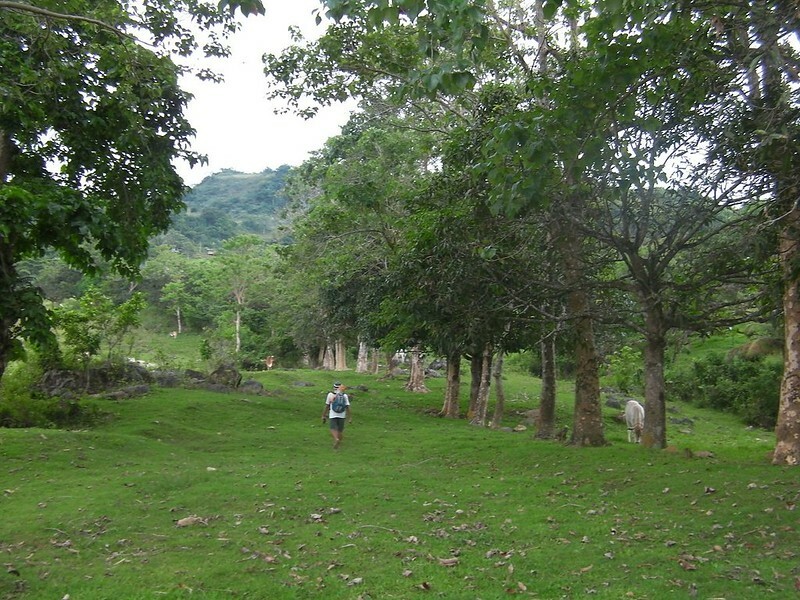 From Sunny Hills, Talamban, we headed to Sitio Baugo, our jump-off point in Baranggay Budlaan where we started the trek. 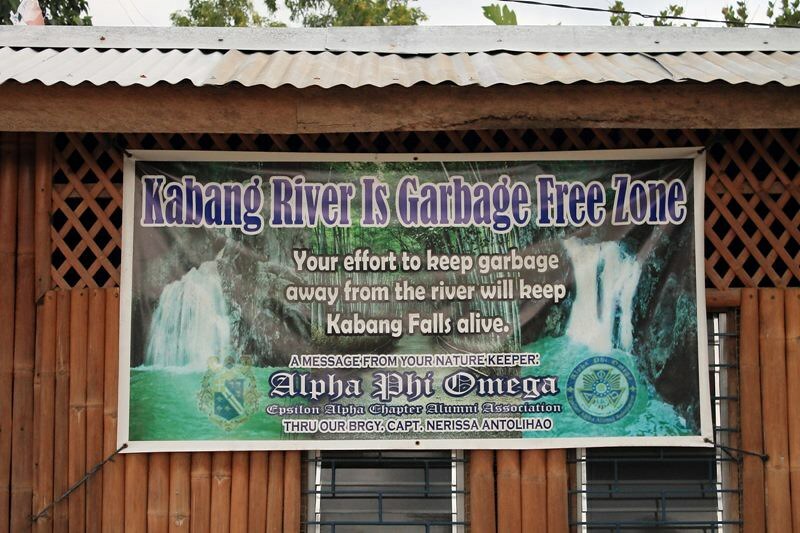 It’s a good thing that Baranggay Budlaan’s LGU recognized the need to protect their natural treasure. 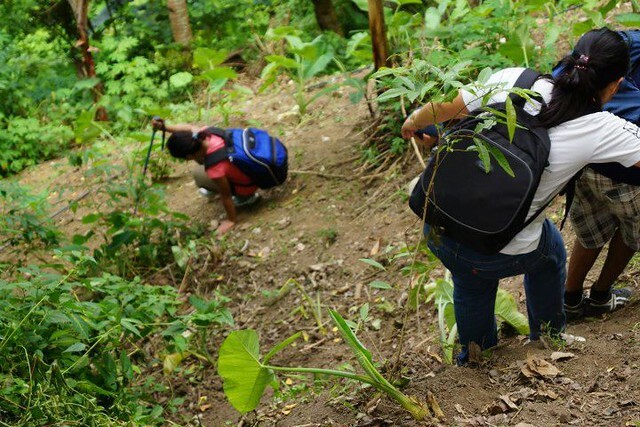 Along with the APO, the LGU encourages trekkers and mountaineers to preserve this magnificent natural wonder by keeping it clean and free of vandalism and garbage. After a short prayer for safety, security, and blessings, we headed off into the light forest that leads to the base of Budlaan River System. 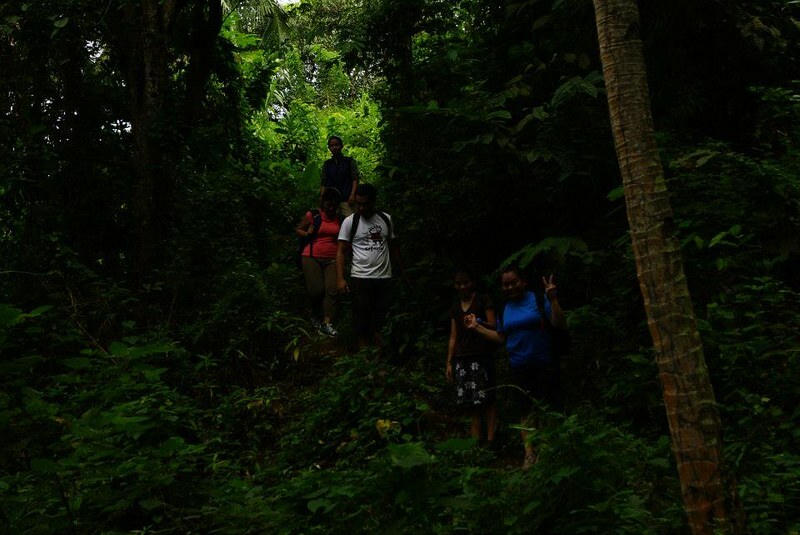 Within just a few minutes of the trek, we can see the splendor of Cebu’s verdant mountains, tucked in secrecy by Mother Nature herself. 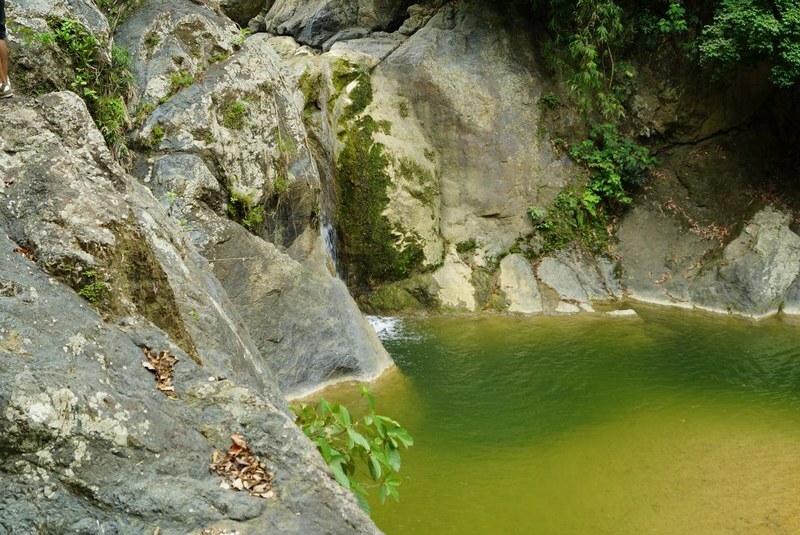 After 45 minutes of leisurely trekking, we finally arrived at this beautiful pool that is fed by the river. This is the official starting point of the first segment of the adventure: river trekking at Budlaan River System. After letting the group drink in the beauty of the place, the agony began. 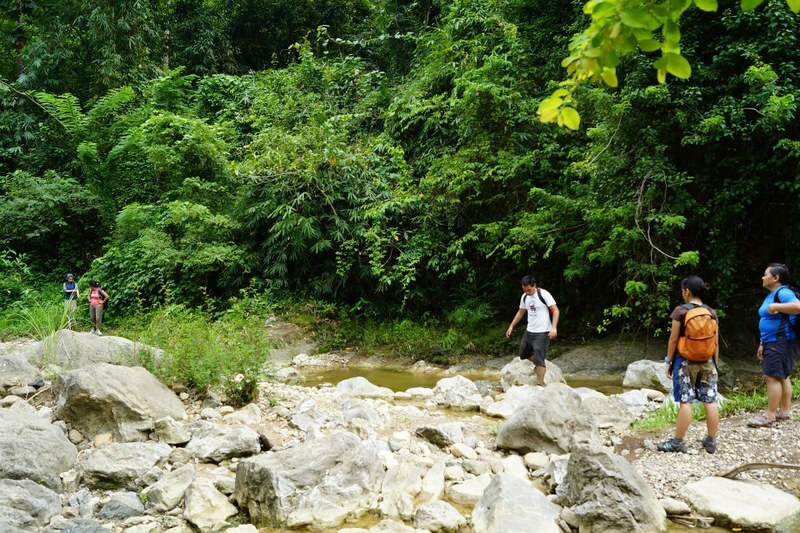 To get to Baranggay Budlaan’s best kept treasure, we needed to walk upstream. 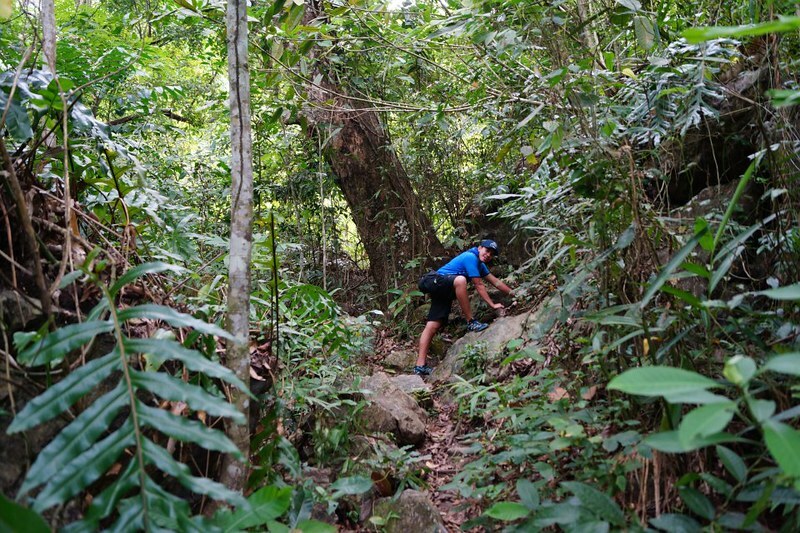 Doing so involves scrambling over slippery boulders, some of which are the size of small houses. In some sections of the river, you can reach the edge where walking on slightly muddy ground can be a respite after all that hard scrambling. Sweetie and I were leading the team, so we went ahead to scout for possible routes through the river. 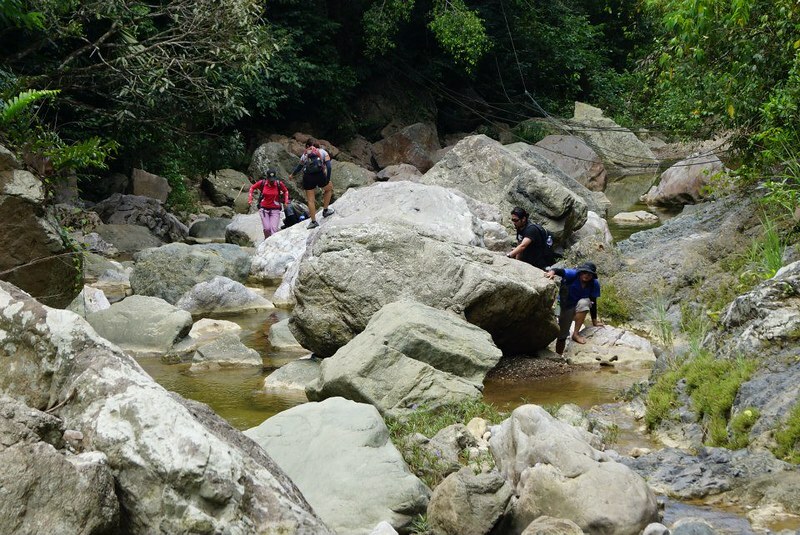 After huffing and puffing along, the team climbed a huge boulder situated at the edge of a small waterfall. 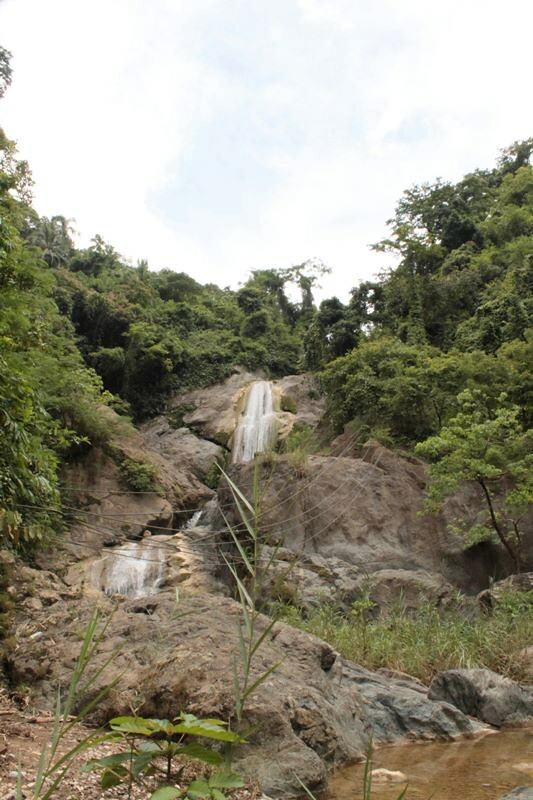 When you get to this area, you’d be glad and assured to know that Kabang Falls is just around the corner. The green pool is really enticing; it’s almost impossible to resist jumping into it during a hot summer day. The nice thing about having an adventuring partner—and sweetheart—is that you begin to fully recognize and accept each other’s significance in achieving your dreams. After awhile, we heard the unmistakable mighty sound of millions of gallons of cascading water. Kabang Falls shyly reveals herself. The main waterfall is actually way above the river. To get to it, trekkers need to climb that immense, cliff-like boulder at the right.
. . . then you need to climb over a couple of huge, slippery boulders that are crawling with fire ants. 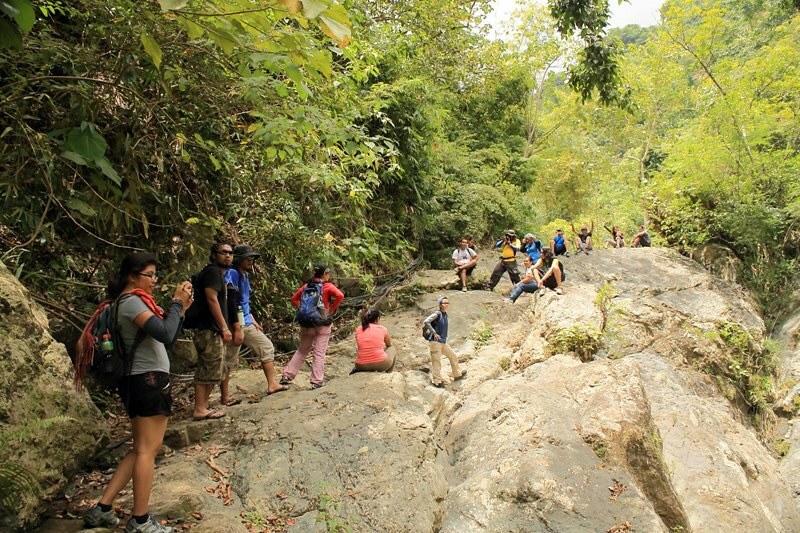 Trekkers emerge at the right side of the magnificent Kabang Falls. The glory of Kabang Falls. Nothing beats the beauty of nature. Kabang Falls is a classic example of a horsetail waterfall, a waterfall wherein the cascading water still makes contact with the bedrock. It was a bit past noon when we reached the Kabang Falls pool. That only meant one thing: it was lunchtime! Time to take out all that delicious packed meal we cooked or bought from carenderias. 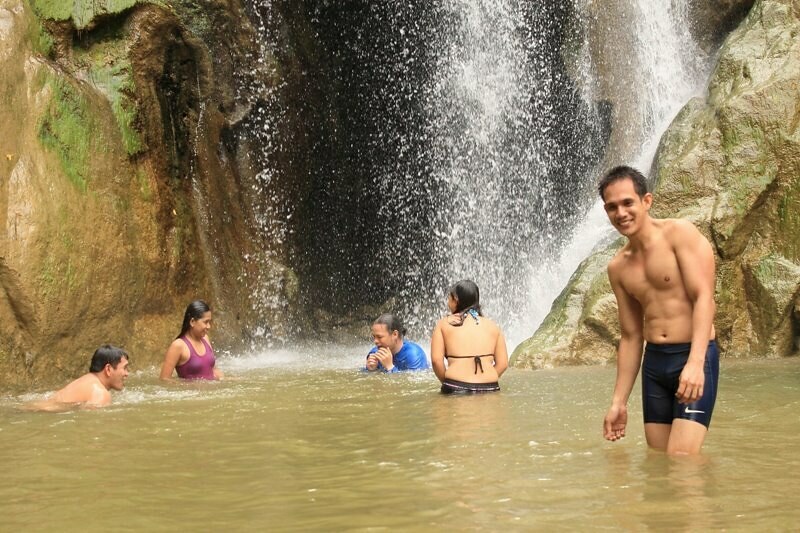 Refreshing dip at Kabang Falls! The water here is refreshingly cool. 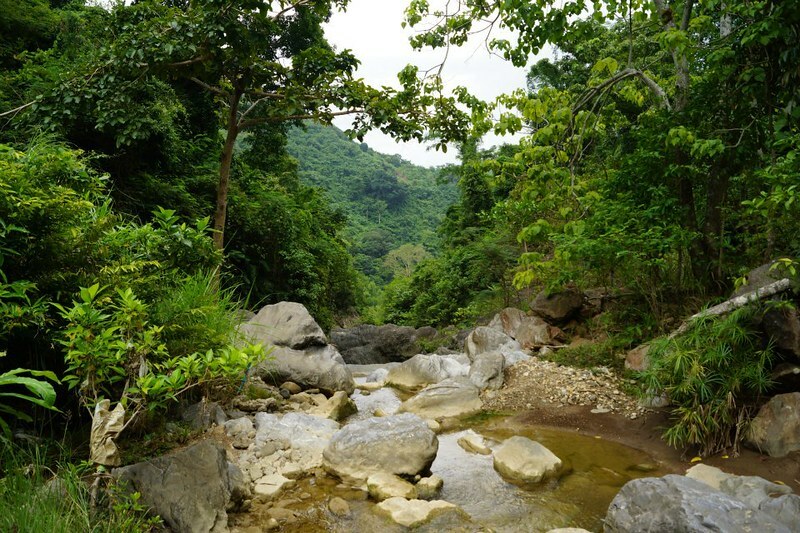 Consider a dip in the cool water as a reward for completing the very first part of the trek. 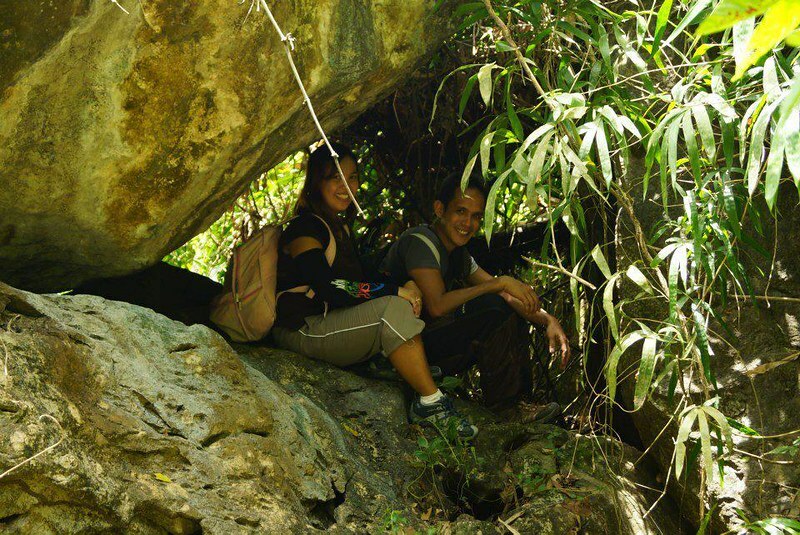 Adrenaline Romance sweethearts in front of one of Cebu’s best kept secrets. This image also gives you an idea of how massive this waterfall is. 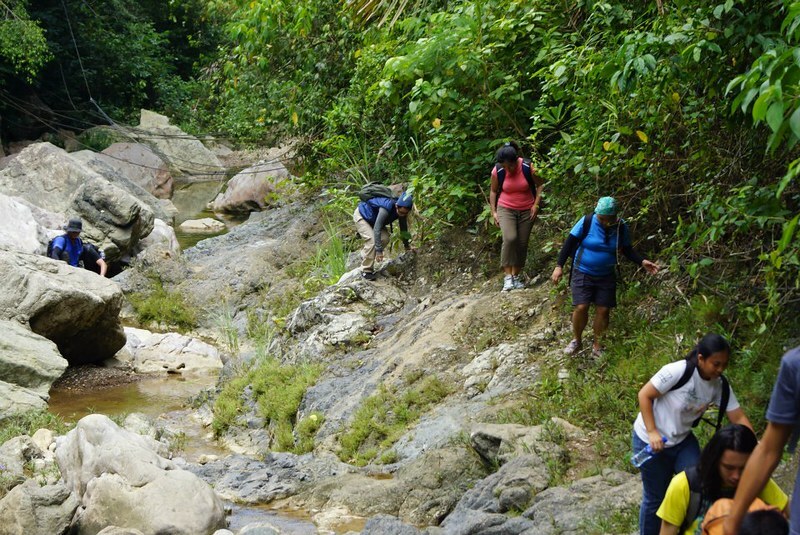 After that excellent lunch and invigorating dip, the team was ready for the second part of the adventure: a treacherous uphill climb at the side of the waterfall and a trek into the jungle. The team entered light woods that line along the side of the upper part of Budlaan River. Check out that steep embankment at Jody’s left side. A misstep to the left can send a person careening over the edge. Didn’t I tell you that I have a poor sense of direction? Yes, you guessed it right. We got lost. We got stuck in an orchard garden which seemed to be a dead end. Half an hour later, we found the trail and discovered why we didn’t see it in the first place: the head of the trail was completely overgrown with grass. This is a valuable lesson: never underestimate mountains because, like people, they continuously change. 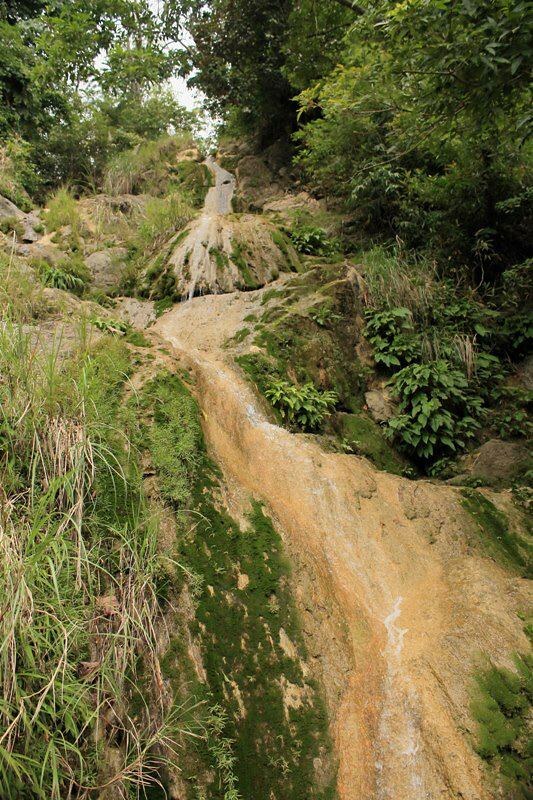 To get down to the upper part of Budlaan River from the mountain slope, we have to slide down a—well, a mountain slope. Be careful! That loose dry soil can be quite slippery. This is where a trekking pole and trekking shoes with heel brakes come in handy; they allow you to control your descent. We exited the slope and entered the upper river where we rested a bit. A short while later and after making sure everyone is okay, we proceeded to the mountain opposite of the river. Yes, it was another tough climb. Well, no matter how tough the climb is, if adventure is in your heart, you will always manage a genuine, happy smile even when your heart is about to burst. 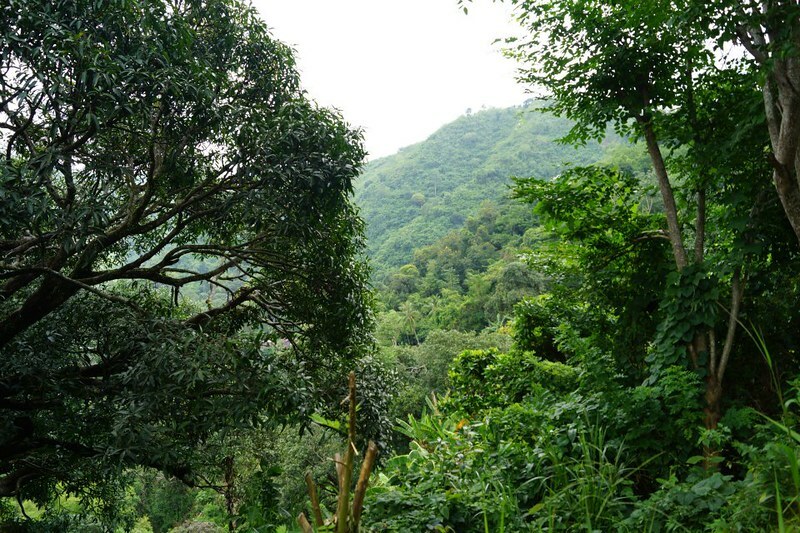 The opposite mountain features an even thicker jungle. The last main hurdle of the river is this dried-up waterfall. See the moss? That means water still flows down it, probably during rainy season. And yes, it involved climbing it to get to the water source. A short while later, we arrived at the water source. 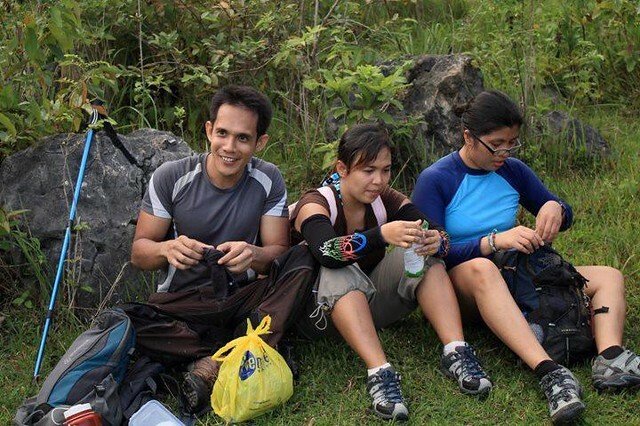 Trekkers can fill their water bottles and take a much-needed rest here. If you wish to camp, you need to get as much water here as possible because this is the last water source along the way. There’s the water source. Don’t worry, the water is extremely clean. 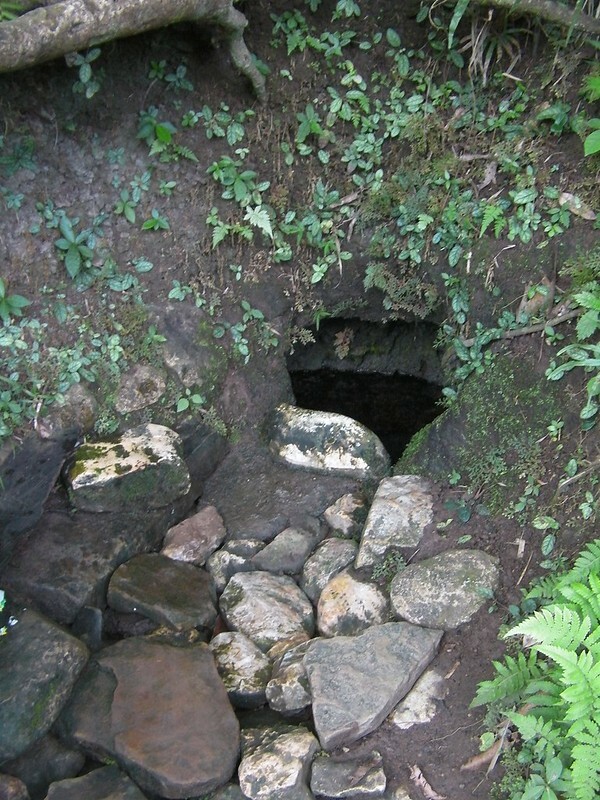 It comes from a “tubod,” which means it is pure groundwater. Mind your manners and take a cup or “tabo” to scoop up water and pour it into your water bottle. Do not dip your water bottle here; it might contaminate the water source itself. What a spectacular view! We came all the way down there. After resting for a bit, it’s time to climb again. See how happy we are? 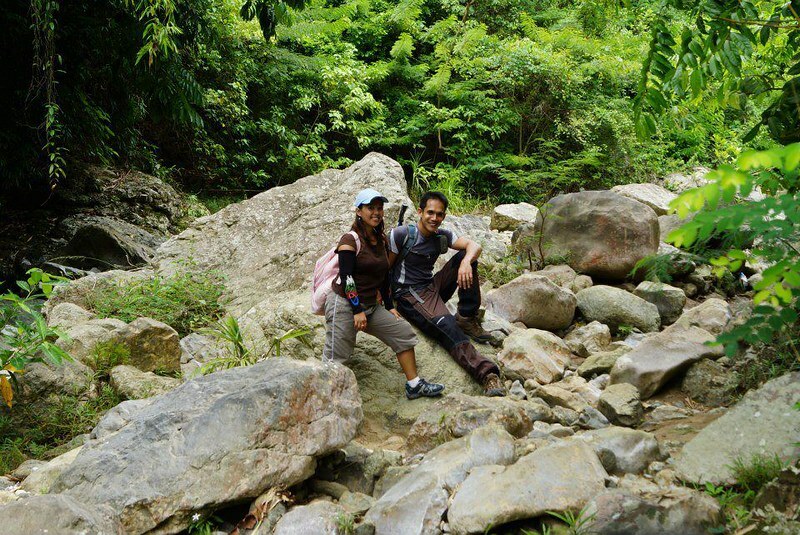 Climbing with your adventurous sweetheart is really fun! 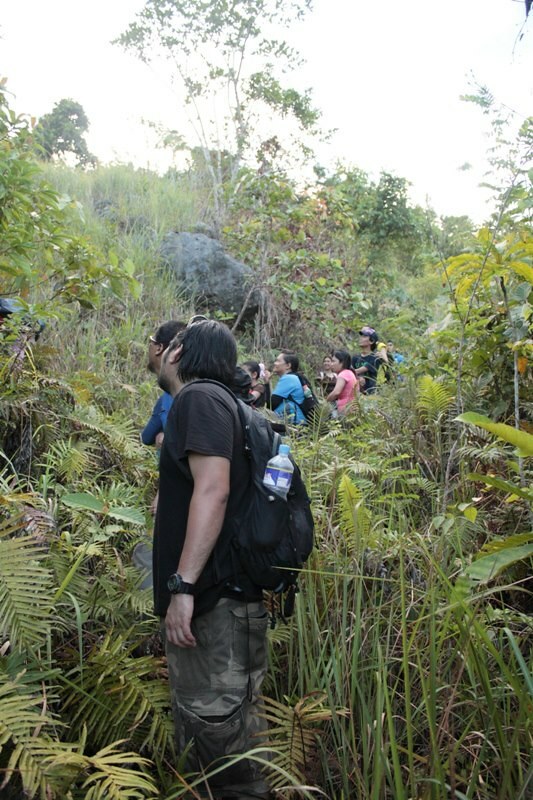 An hour later, we were out of the jungle and entered the Sirao-Busay highlands. The grassy valley filled with strangely shaped trees, green meadows, and immense flower plantations makes you think that you died and went to heaven. 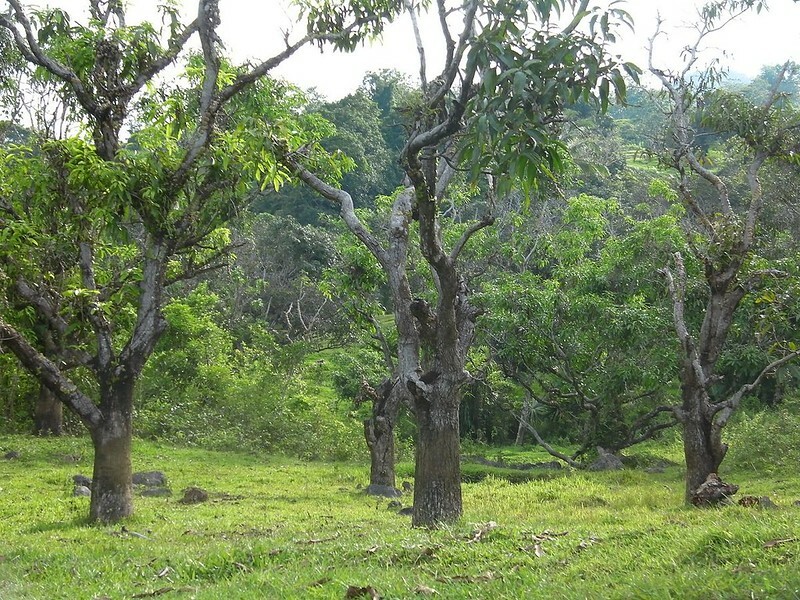 The Sirao-Busay highland valley is dotted with these weird Lord of the Rings trees. We wouldn’t be surprised if J.R. Tolkien got his inspiration here. This is where Gollum led Frodo and Sam to Mordor. Have you ever wondered where the flowers you buy in Carbon, Sto. Niño Church, Colon, etc., came from? Well, they came from here. 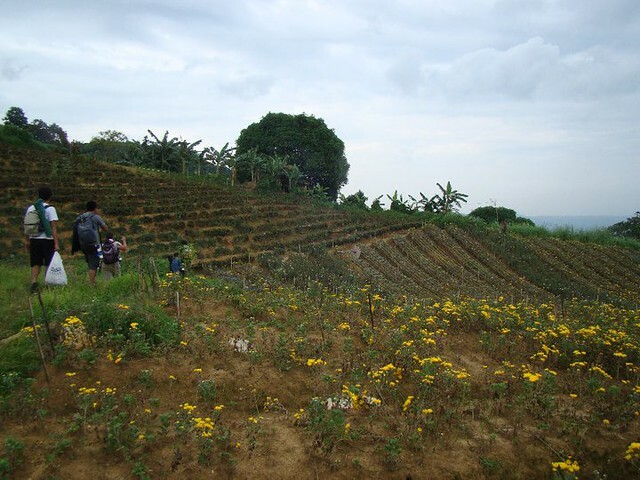 The cool weather and the fertile mountain soil makes the valley ideal for cultivating flowers. A perfect line of trees and a mountaineer make the perfect adventure scene. Believe it or not, those trees are “naturally” planted, meaning, it was Mother Nature herself who planted them in a straight line! Enduring dozens of climbs in one trek can take its toll. Some of our members felt the telltale signs of leg cramps, so we decided to stop on a clearing to rest and to let their bodies replenish their store of ions. 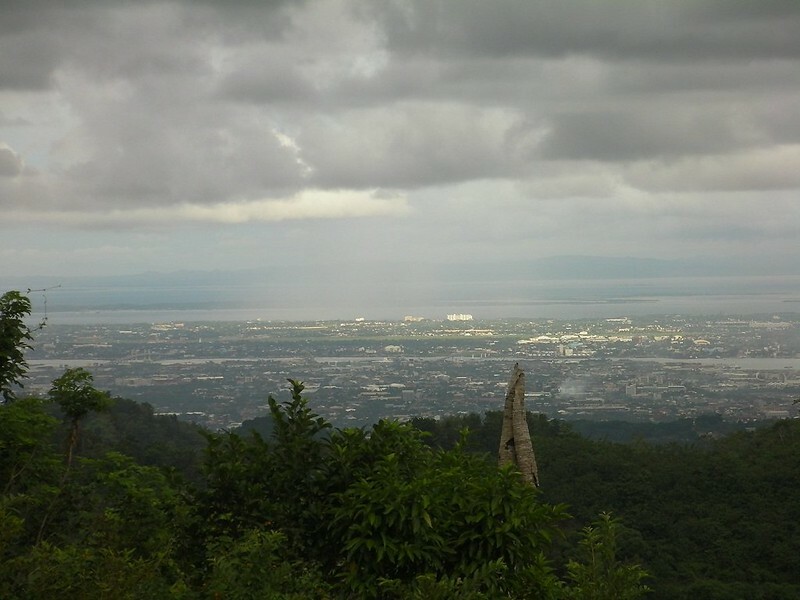 An encompassing view of Lapu-lapu City, Mandaue City, and Cebu City opened up in front of us. How magnificent! Can you identify the structures there? 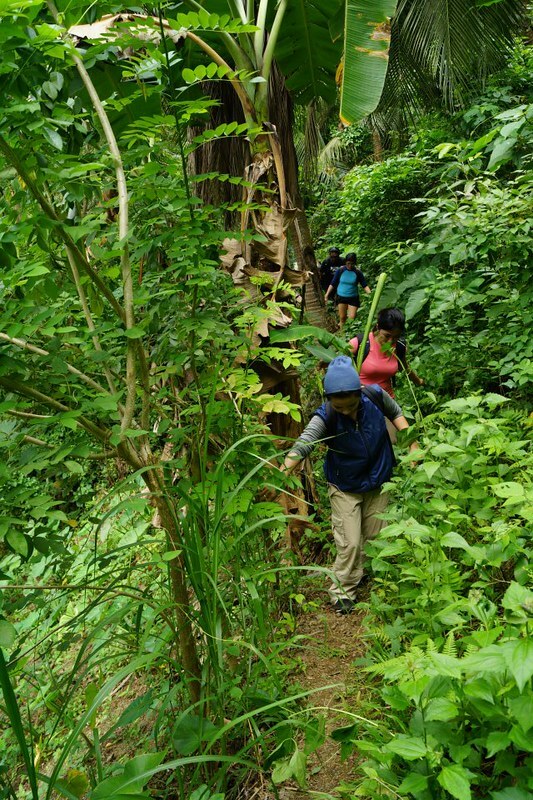 As we approached what EWIT calls the Guava Trail (due to the fact that it runs along a guava grove), we battled razor-sharp cogon grass. Scratches from cogon grass blades are very itchy. It’s important to wear leggings and arm protectors here. 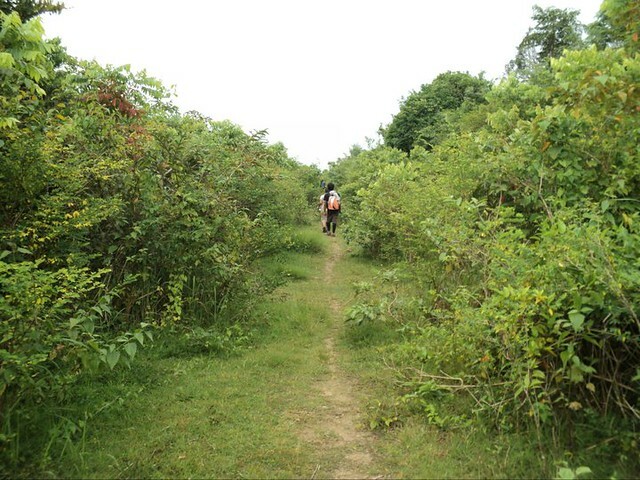 This is the Guava Trail which leads to the forest at the base of the Mt. Kan-Irag’s peak itself. This area also serves as an alternative campsite to the one at the peak. 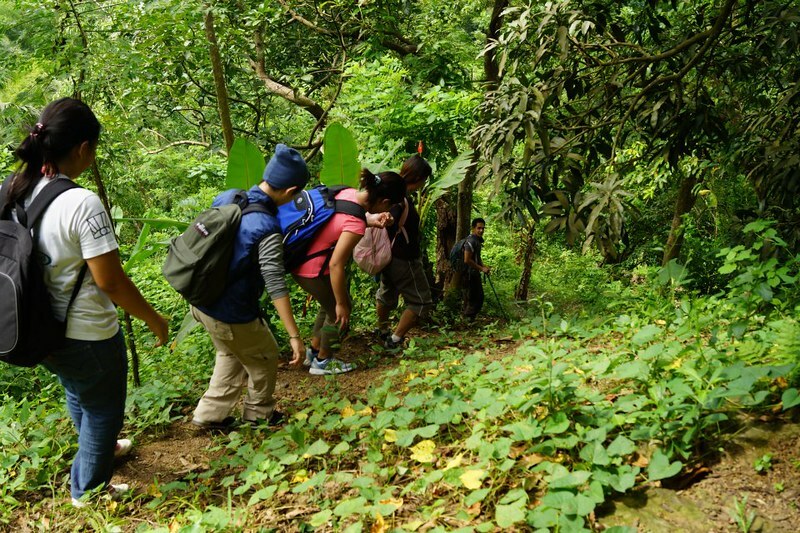 Within minutes, the team entered the jungle, the start of the assault to the mountain’s summit. 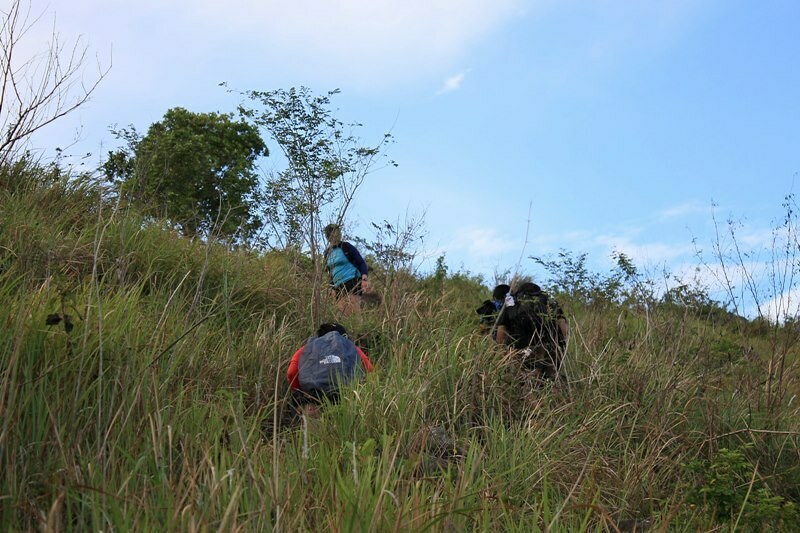 Emerging from the forest, the team battled the last hurdle, an immense field of five-foot tall, razor-sharp, itchy cogon grass growing on big chunks of loose, volcanic rock. 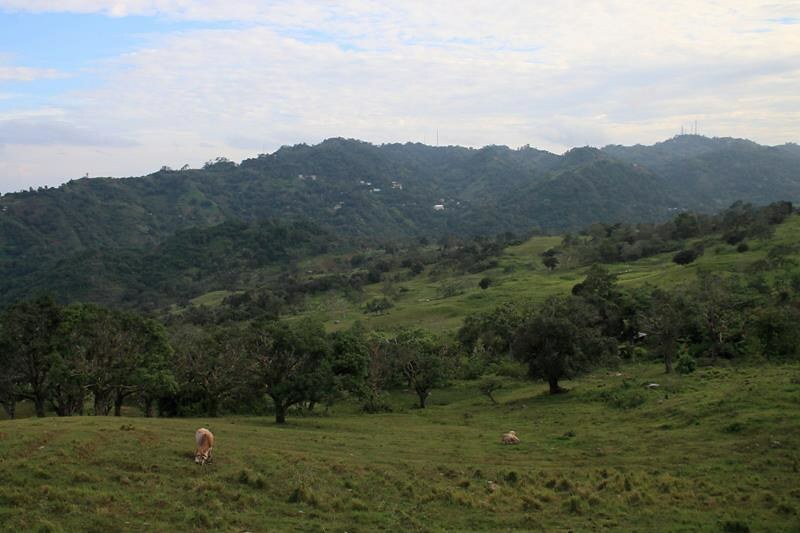 The shape of the field and the presence of volcanic rocks strongly imply that Mt. Kan-Irag may be a dormant or extinct volcano. 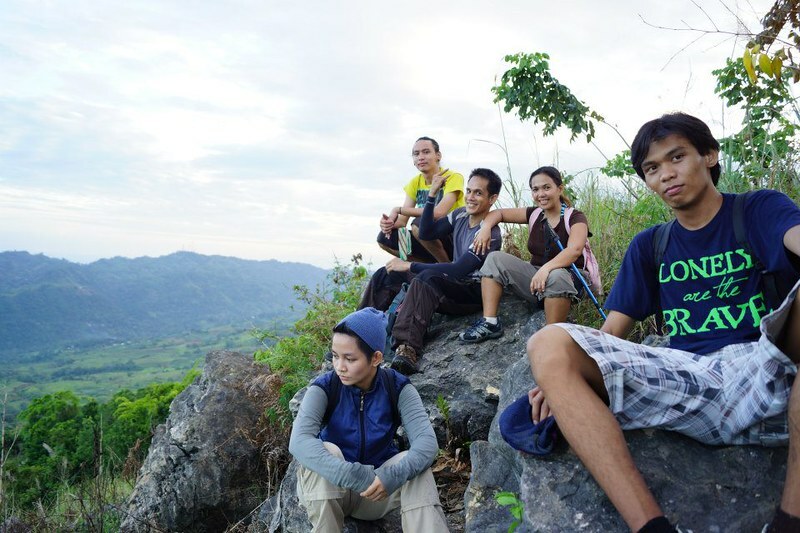 After 5 or 6 hours of river trekking, scrambling, hiking, climbing, and battling the elements of nature, we finally reached Pedro Calungsod peak, the rocky summit of Mt. Kan Irag. Here’s a trivia: do you know that the rock that Sweetie and I are sitting on is called a Lover’s Rock? That’s because female mountaineers never fail to say yes to their male partners’ proposals here. 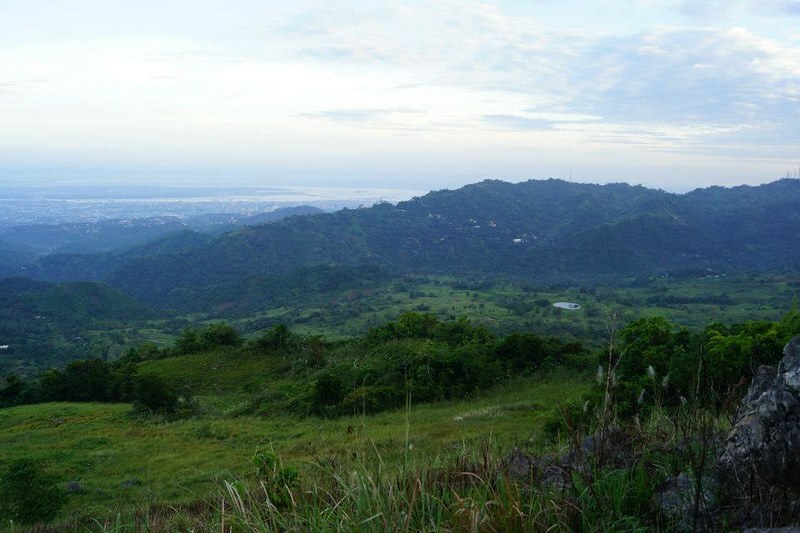 A breathtaking view of Cebu City, Babag Range, Cebu’s central highlands, and the Busay-Sirao valley can be enjoyed at the peak. 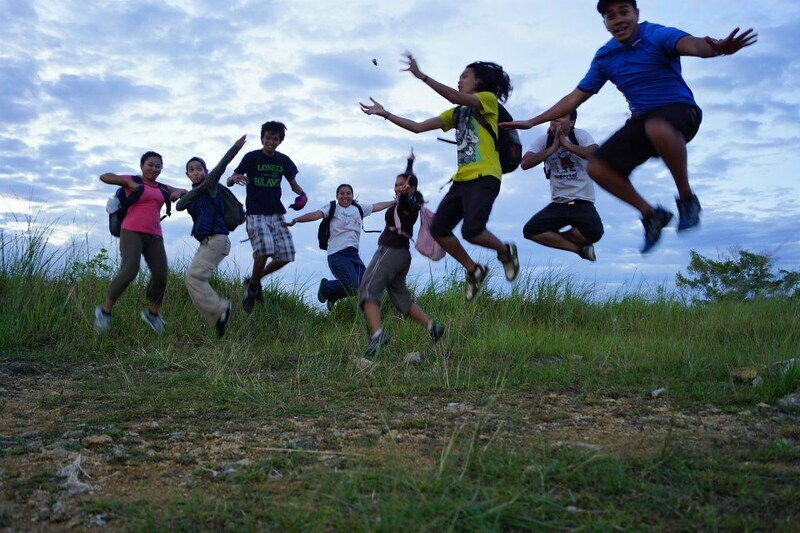 And everyone was so happy upon reaching the peak! 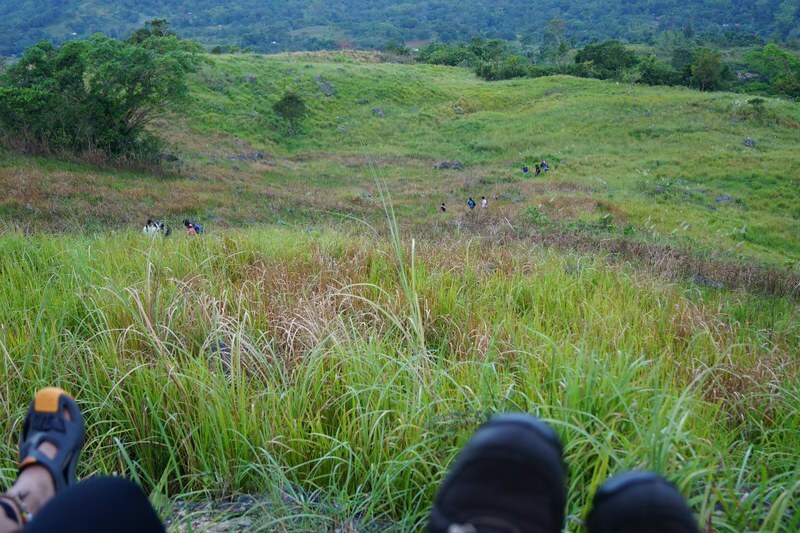 The peak is also flat; that’s why it serves as a campsite for those who wish to have an overnight stay here. Campers may need to bring earth pads, however, because the ground is extremely rocky and, thus, uncomfortable to lie on. Congratulations for a climb well done! At 780 meters, Mt. Kan-Irag is not a particularly high mountain, but the long traverse towards the peak, the razor-sharp cogon grass that covers the entire mountainside, the dangerous volcanic boulders, the raging heat of the sun, and of course, the scenic wonders that mountaineers pass by make every step of the climb worthwhile! Most photos courtesy of Ronald Ramiso and Prince Christian Toyugan. Thank you for letting us use your photos, sirs! 1. 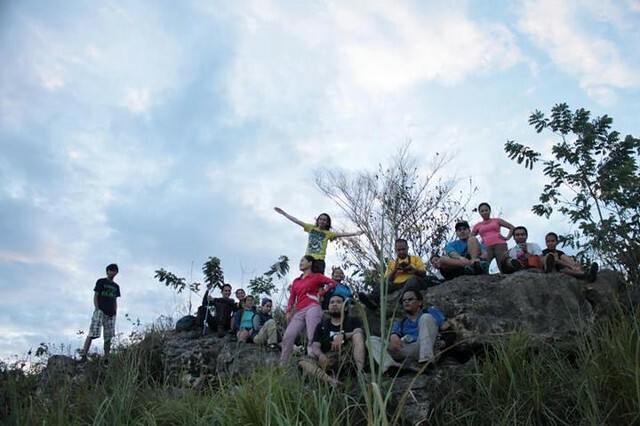 Most Cebu mountaineers know this place because this is their “backyard.” For guideship services, contact Ruel Olaso (09215882345 or 09236651515), Peri Pervida (09284016666 or 09334036408), or Tiki Allado (0922547750). EWIT mountaineers know the many routes to Mt. Kan-Irag very well. Negotiate the fees with them. 2. A Mt. 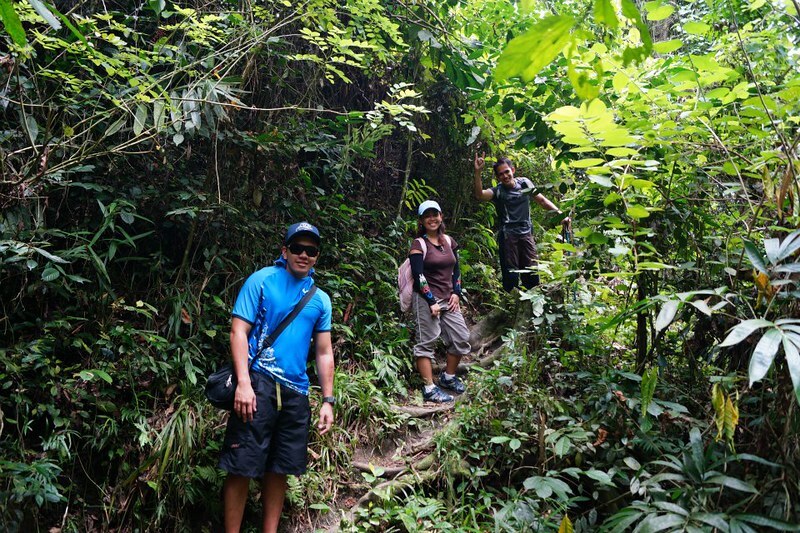 Kan-Irag climb coupled with river trekking is perfect for budget-conscious adventurers. 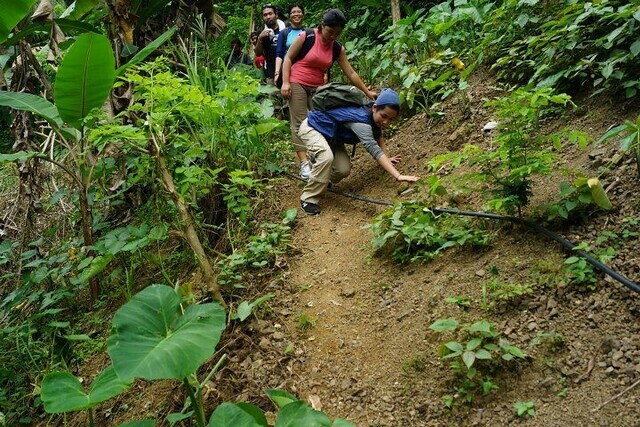 You can actually climb the mountain with a budget of less than P200. The biggest chunk of expenses comes from the habal-habal fare. From Sunny Hills, Talamban to Sitio Baugo, the fare is P25. On the return trip, the habal-habal fare from Ayala Heights to JY Square is P50. 3. 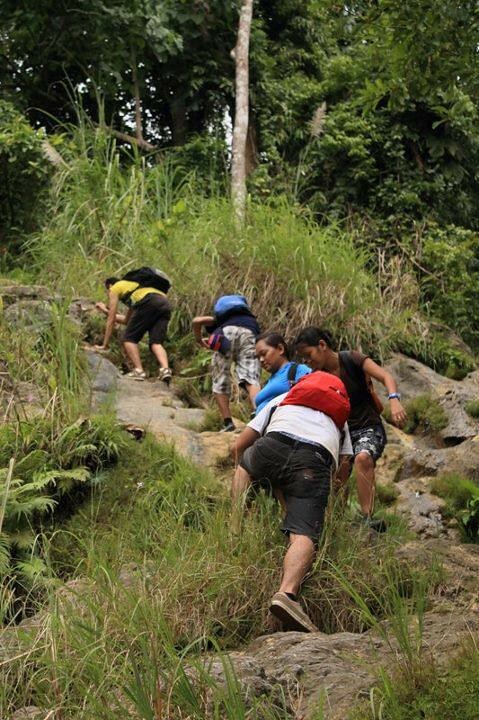 A good, strong rope is necessary to safely climb the mountain slope beside Kabang Falls. Your guide will set up the rope for you. The rope is not used to stop a fall but as a handrail; the slope is very slippery and offers very little handholds. 4. Wear waterproof shoes with an aggressive tread. 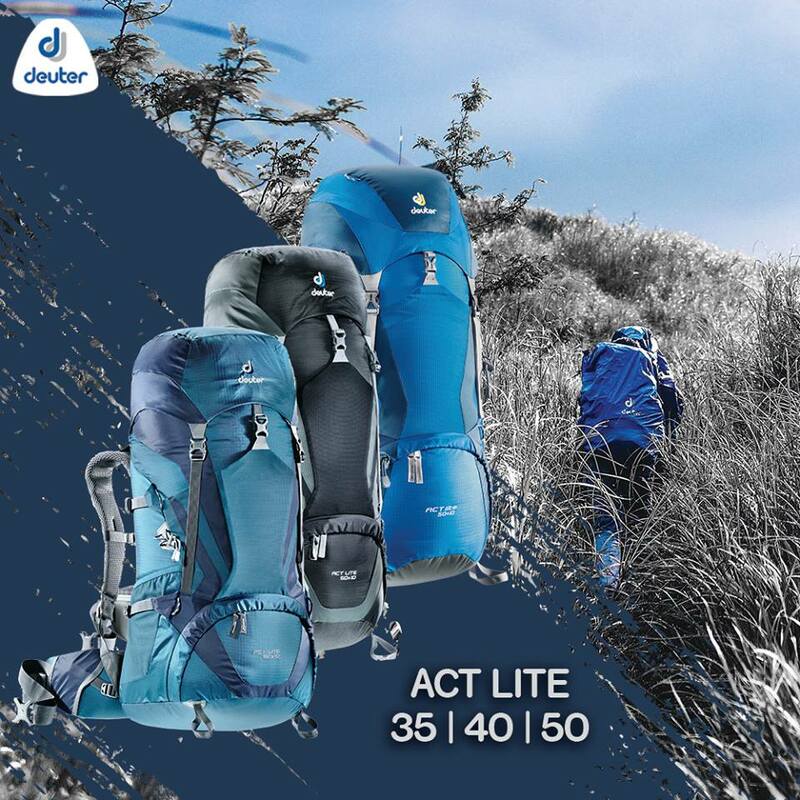 You will need a lot of moisture protection and traction since you will be scrambling over slippery boulders, muddy trails, and lose soil. 5. 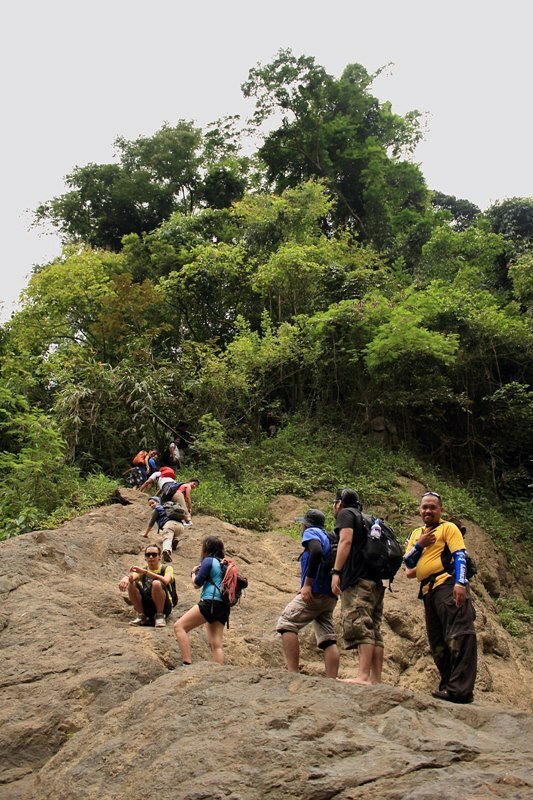 Improve your balance, especially on the river trekking section of the adventure. A lot of the trail section involves you having the basic skills of a ballerina. 6. Bring salt tablets or beverages that are filled with ions (e.g. Gatorade, coconut water, etc) aside from water. The hot sun, multiple ascents, and sudden descents can make you sweat a lot. When you lose enough ions and salts through your sweat, cramps will occur. 7. Bring energy-rich trail food such as nuts, crackers, bread, and bananas. Don’t underestimate the mountain. 8. The plants in this area are thorny, razor-sharp, and wicked. Protect your arms and legs by wearing arm guards and leggings. A good pair of trekking pants will also help protect your legs. 10. You can camp at the peak. On a clear night, the glittering lights of Cebu City compose a spectacular show. Be sure to bring warm clothes if you opt to spend the night there; the mountain can get really chilly. Thanks! Yes, you should go there. It’s technically in Cebu City, and habal habal rides to the jumpoff are plentiful. And you can find locals who can guide you to the waterfalls. To proceed to the mountain, however, you would need a guide who is familiar with the place. Check out the “tips” section in the blog for information on contact people. Such an amazing pair! The pictures drag my interest back to climb again! Cheers! Thank you for the compliment. For us, it’s always love and adventure. If you’re anywhere in Cebu, give us a ring. We’ll take you to our adventures. Thank you very much for your informative blog. 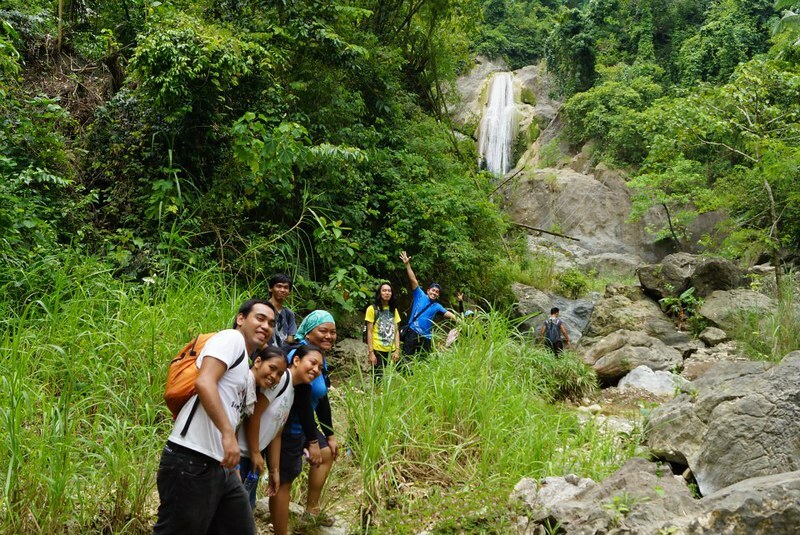 We made it to Kabang Falls last Sunday. Unfortunately, the water in the falls has dried up due to the summer craze. 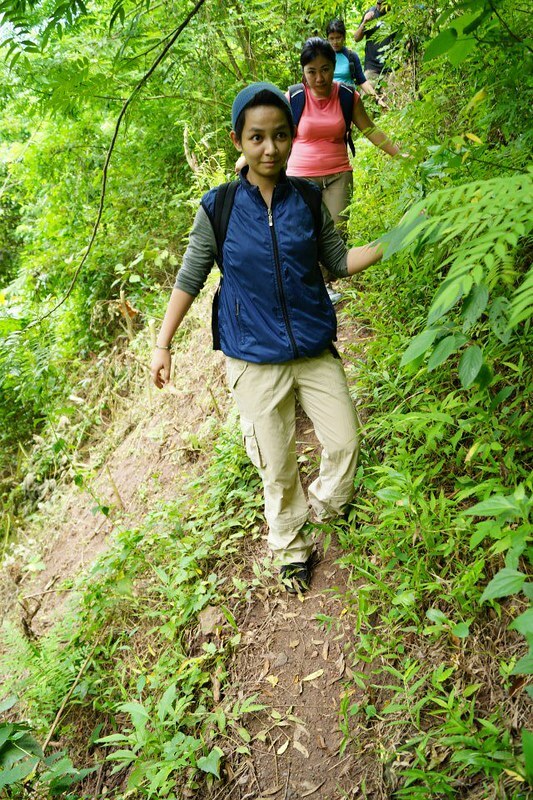 We enjoyed the trek and most especially the sceneries in the place. May you continue to inspire and guide other people in their journey to travel and enjoy the beauty of Mother Nature. You’re welcome and thank you for taking time to visit our humble blog. We haven’t seen a dried-up Kabang Falls, but we heard from fellow mountaineers that it dries up, especially during summer. With summer heat such as this, we wouldn’t be surprised if there’s no water trickling there. The scenery that you see toward Kan-Irag is definitely beautiful. It’s like a meadow slash Lord of the Rings landscape. Perhaps some time, we will meet on the trail. Keep on adventuring! Me and my 2 friends are planning to try this adventure this coming April. Is there a trail map from kabang falls to Mt. kan-irag? Is the trail easy to follow? Please advice. 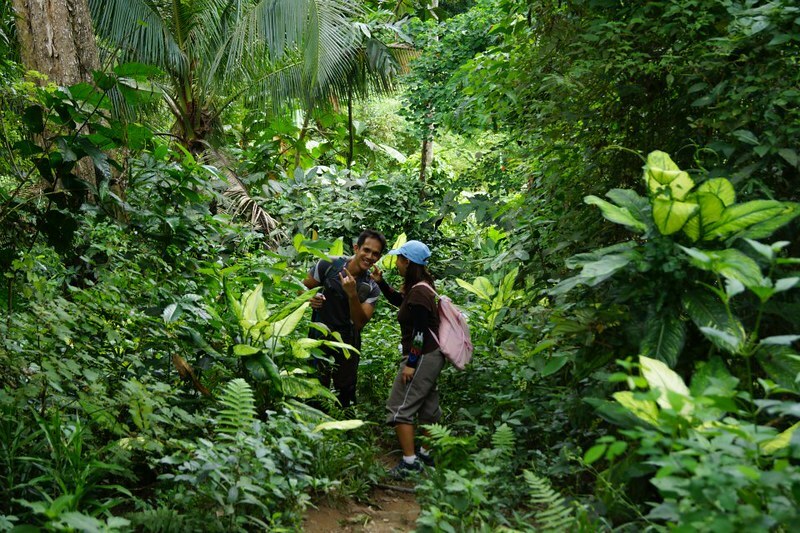 Unfortunately, there’s no trail map from Kabang Falls to Kan-Irag; trail maps are almost unheard of here in Cebu. Trail difficulty is manageable. 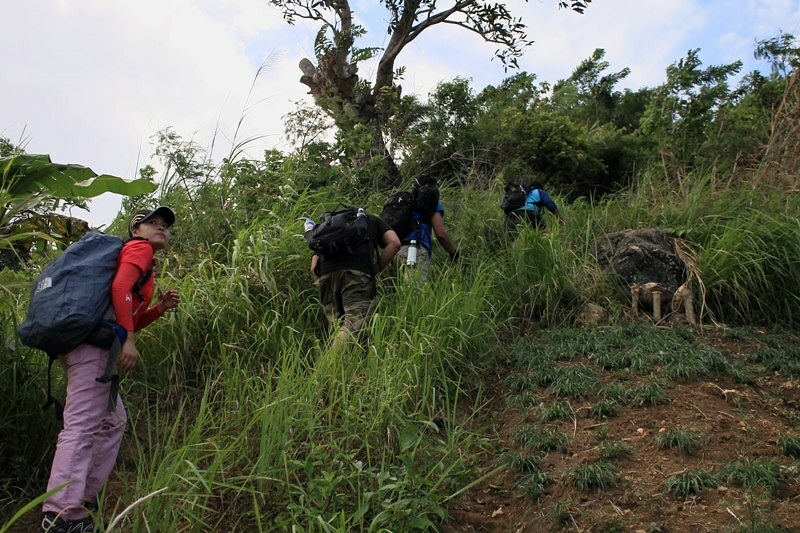 Fortunately, there are plenty of mountaineers who know the trail because that trail is considered the “playground” of Cebu outdoorspeople. 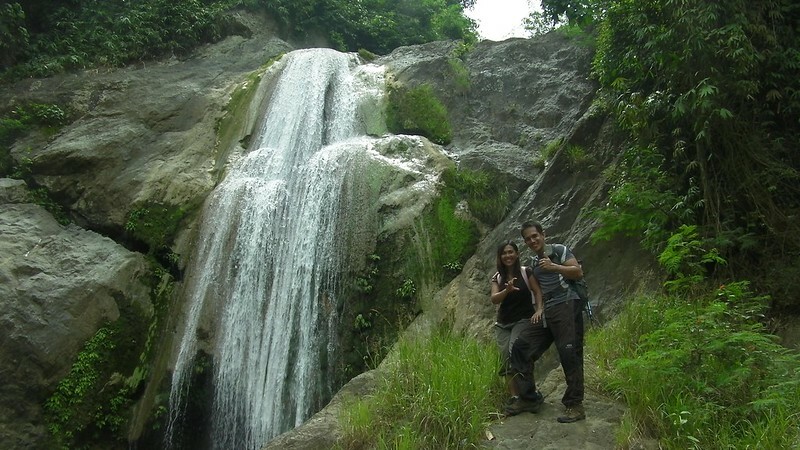 Please visit the Facebook pages of either “Visayan Trekkers Forum” or “Enthusiast of Cebu Outdoors”. You can ask the fellows there to guide you. I went there a couple of times, the last one was two years ago when i practically led my group of 4. We reached a dead end since i forgot where to go to reach kabang falls. I didnt see that “cavelike cavity” you mentioned on this post so we ended up following a trail on the left which led us to a house and we continued our trek to malubog. We still passed by that dried up waterfall leading to the water source but we never got to see kabang falls 😦 it was a fun trek nonetheless, since we were all just left guessing which way to go. Hehe. Thank you for posting these photos. At least i have a picture of what to look for to get to the next waterfall. Im hoping i can find it this time since im planning to go there with 2 friends this weekend. Now my problem is…. 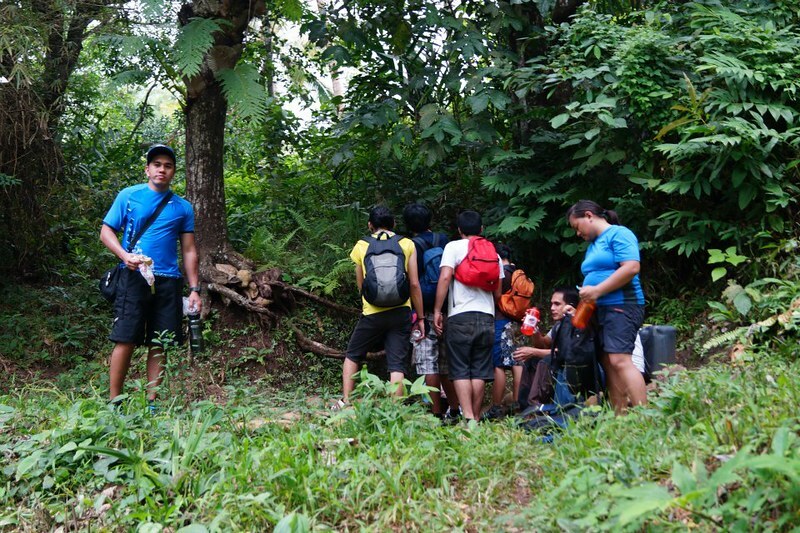 When we finally reach kabang falls, where do we go? You mentioned “a treacherousclimb at the side of the waterfall”. Is that the (right) side where you and shiela were standing? Ive done this without ropes but im bringing some friends who arent very used to this kind of activity. You think itll be ok? Thank you for visiting our blog post. Sorry it took a while to reply; work was killing us. Hehehe! 1) Regrading the cave-like cavity, it’s at the right side of the river, just before you ascend that big boulder going to Kabang Falls. 2) To get back on trail, you had to climb a very steep slope at the left side of the waterfalls, way above the sloping rock. But recently, we heard that the trail has been fenced off by the property owner. There is another way though and that’s a steep climb at the right side of the waterfall. You don’t need ropes because there are water pipes which you can hold on to. 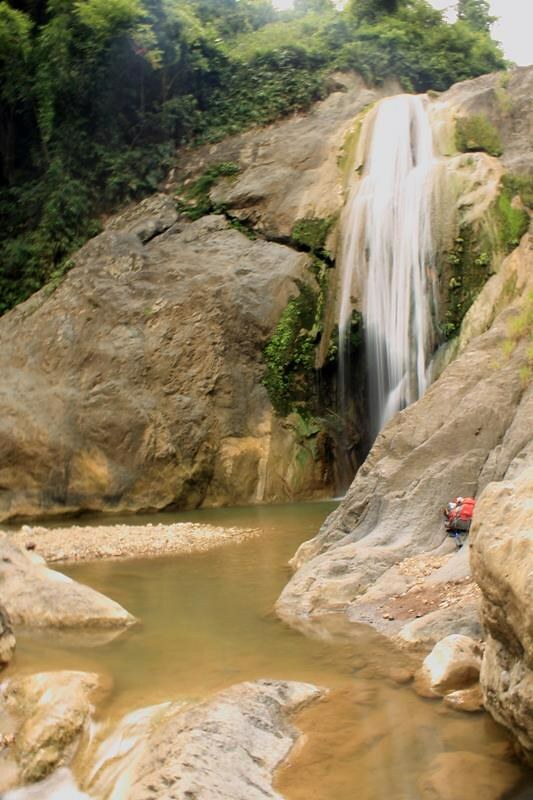 When you emerge from the forest, you’ll end up on top of Kabang Waterfalls where you may resume your trek. Thanks for the mail. I’ve been tried to contact the people you recommended as a guide for this mountain adventure but wasn’t able to contact any of them. Peri’s number rang though but never received a reply from him. Are you still in contact with them? Please let me know,,, thanks! my number is 0932 883 4357. Oh, no, they probably changed their number. Thanks for that info; we’ll update the blog. 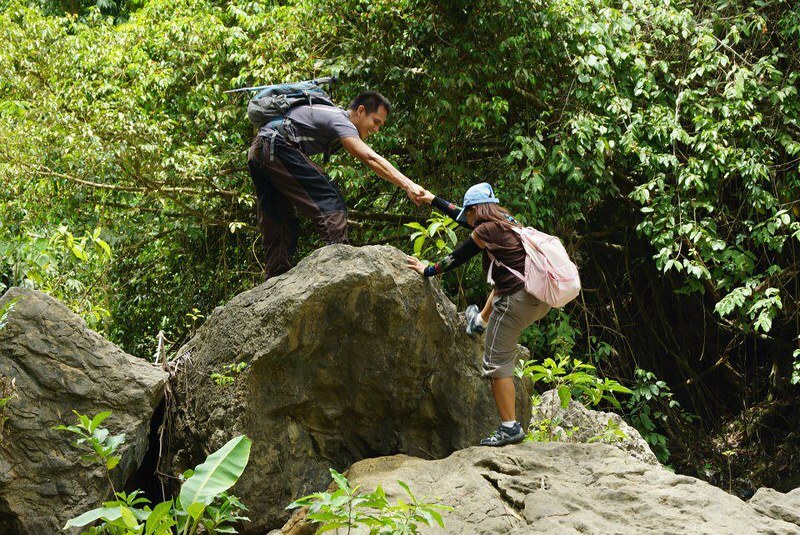 To address your concern and to give you a better leverage, we suggest visiting two Facebook groups “Visayan Trekkers Forum” and “Enthusiast of Cebu Outdoors (ECO).” After joining, you can ask for someone who can guide you up Kabang Falls and Mt. Kan Irag. I’ll check those groups and let you know soon. Thanks! Thank you very much too for taking time to check out our blog. 🙂 Readers like you inspire us to travel and adventure more. Hehe! We can’t make a trail guide because honestly—and this is quite embarrassing—-we are not really good when it comes to mapping out ways. In fact, we have to hire guides because we have a very poor sense of direction. And it’s for safety reasons too. Me and hubby are planning of going there supposedly last weekend but unfortunately we had a rainy long weekend. My husband just want to make sure if the Kan Irag Nature Park is still operational? Do you have any idea? We are not planning of having a trek but just to stay at the park to finish a project. Me personally, want to have that kind of environment (nature in the surroundings) to inspire me. Peace and quiet, kumbaga, hehehe…Any idea? Thank you for getting in touch with us. Are you referring to the Kan Irag Nature Park that is owned by the Ayalas? We’re not sure but it seems they are not operating anymore. You can try out Canso X in Balamban as an alternative. Hi Gian! Your blog is very interesting and I gained a lot of information. Me and my friends are planning to go there and I have a question. When you reach the Peak, where can you find the Habal2x? Is it near the Peak? Thank you for visiting our blog. No, there are no habal-habals near the peak. You have to exit the peak and walk for 20 to 30 minutes or so until you reach the Ayala Heights Subdivision. From there, you can hail a passing habal-habal, or you can walk a little farther to a small community where there are plenty of habal-habals around. HI, would this place be safe for inexperienced trekkers? Yes, it’s safe. But just like in any outdoor endeavor, you need to take extra care. Whenever we look for an adventure I browse your site. It is very informative. Thank you for your blog. I am your avid reader Adrenaline Romance. Hi God afternoon how much the package tour to mt. Kan rag +kabang falls? Do you have schedule between April 4-8,2016? We don’t offer a package, and we don’t guide. 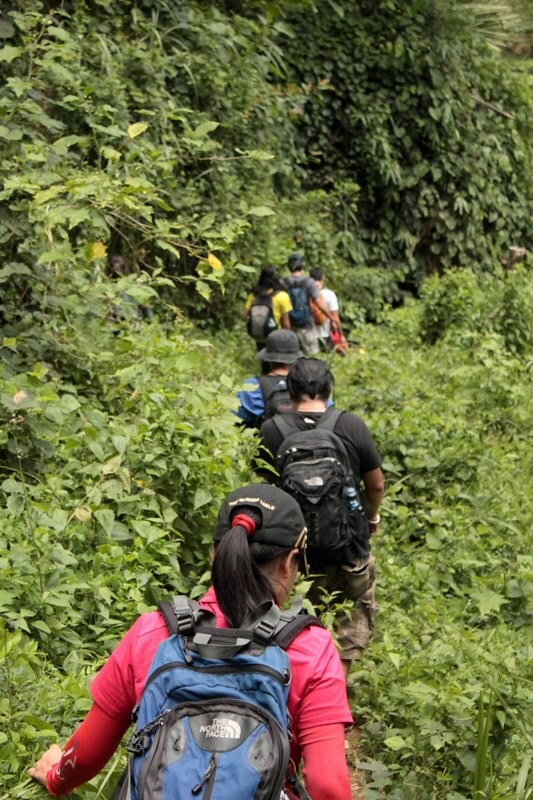 We are simply bloggers, and the trek to Kabang Falls to Mt. Kan-Irag is just one of our adventures. 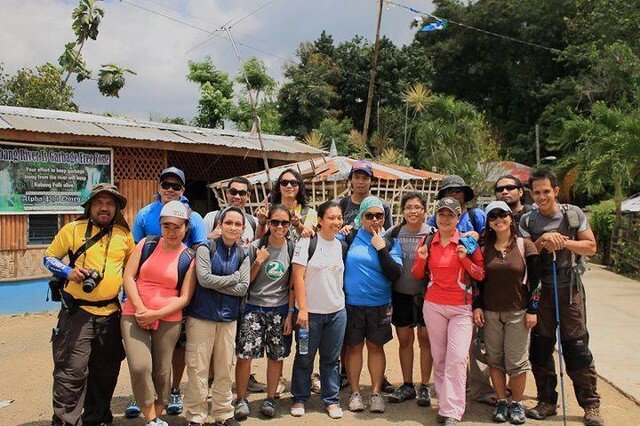 If you want guideship services, we recommend you visiting the FB group “Visayan Trekkers Forum” or “Enthusiast of Cebu Outdoors,” and ask for guideship services there. Hope this helps. Thank you. Just want to ask how many minutes or hours it takes trekking to Kabang Falls if I started from the jump-off at Stio Baugo? And is there a need for a resident there to guide us? or the path is just easy to recognized , is there a signage and/or a trail for easy identifying which way to go towards the falls? If we will ask for a resident guide how much is the guide fee if ever if you have any idea sir? 1. It depends on your pace. On a brisk but relaxed pace, it would probably take 4 to 5 hours. 2. We usually join a small outdoor group or ask a friend who is familiar with the trail to guide us. But it is definitely possible for locals to guide you to Kan-Irag. We haven’t tried asking a local to guide us yet, but we’re pretty sure they know the way. Consequently, we are not sure of the rate, but Php 300 to Php 500 would be a good benchmark. 4. The trail is a popular one, but there are no signages. This is somewhat akin to a farming/backdoor trail. Meaning, it is used by locals to go around, but it’s not originally intended for trekkers. thanks sir. I am planning for Kabang Falls. It is nice visiting your blog I have lot of places that I wanted to go as I see your postings. Thank you very much for your nice words. Keep on traveling and adventuring!